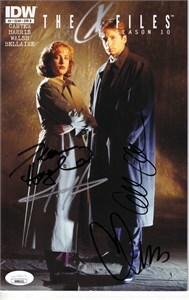 X-Files Season 10 issue #2 (Cover B) Dark Horse comic book autographed on the cover in black marker by actress Gillian Anderson (Scully), actor Dean Haglund (Langly) and creator Chris Carter and in silver marker by writer Joe Harris. Obtained in person at limited 2013 Comic-Con signing. Authenticated by JSA with their matching numbered sticker on the cover and certificate of authenticity card, plus photo from the signing. ONLY ONE LEFT.